Made for the Hesketh family eastern Neston Northamptonshire by Worcester for the family. Circa 1810. Purchased from the sale at Sotherbys Bond Street, of Kristy Hesketh. Other parts of the service were purchased from the coutry huse sale when the family sold out for the first time. The set is comprised of 19 soup bowls, 35 plates, 2 large tureens with lids and on the dishes and three small tureens 1 large serving Asha and 1 Asha with its lift off drainer , with its gravy stoop and 8 sideplates , three small tureens, and 3 vegetable dishes. 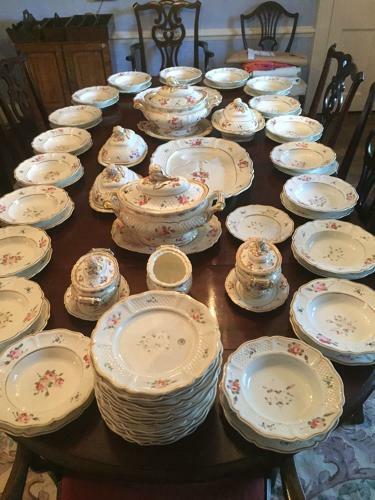 80 pieces in all, Plus Leeds and under plates.